Christmas break is in its second week; have you seen your teen around lately? Why do some teens and pre-teens hibernate in their rooms and seem to shun contact with the family? Sometimes it’s a personality issue. Introverted teens who have spent the school day surrounded by dozens (or hundreds) of other people may need the time alone to recharge. Sometimes it’s because privacy is something new and worthy of exploring. Perhaps a teen no longer has to share a bedroom, or a wise parent has allowed “privacy hours” when siblings aren’t allowed to disturb. Teens relish time to themselves, because they have the chance to think deep thoughts (or to wallow in their angst). Teens with creative gifts can be insecure about their unfinished music-art-writing projects and will be irate if they’re interrupted in the middle of their masterpieces. Those who are involved in relationships may be embarrassed to have their words of endearment (or their giggles) overheard by others who might tease them. Conscientious students may need the peace and quiet for finishing homework. If you’re concerned because your teen seems to be spending an unusual amount of time alone, find a good time to approach him (be sure to knock first) and casually ask if everything’s okay. If you feel it’s important for him to spend at least some time with the family, be ready to negotiate how much time you expect, or what hours you’d like him to join the family. If you’re not comfortable with her spending so much time behind closed doors, sit down with her and tell her there are some new house rules in effect. Be prepared to justify your reasons and try to work toward agreement on when it’s okay to close the door and when it’s not. Your goal is to acknowledge and accommodate your teen’s need for privacy while still encouraging (or insisting) on being part of the family. Remember: that which is forbidden becomes more desirable. Don’t take your teen’s need for “alone time” as a sign of rejecting you; instead, see it as another phase of development, a step toward one day living away from the family. When you’re six years old, Christmas is magical. You sing in the Christmas program, get your picture taken with Santa, pore over the Toys R Us catalog, and make paper chains to festoon the classroom. By the time you get to the end of Christmas Day, you’re exhausted from all the excitement. But somewhere around 12-13 years old, the magic disappears. There’s no Christmas program, it’s creepy to even consider sitting on Santa’s lap, nothing in the Toys R Us catalog interests you, and your middle school classrooms have few – if any – decorations. By the time you get to the end of Christmas Day, you’re disappointed and unsatisfied, and you can’t quite figure out why. It may have something to do with your gifts (earphones, a wallet, a handful of gift cards), but much of it stems from the days and weeks leading up to Christmas. This is where we as parents can make a big difference. I can sum it up in three words: GET THEM INVOLVED. In our house, this started when my sons were toddlers. I would hand them unbreakable ornaments and let them decorate the bottom half of the tree. They thought this was so much fun, they would re-decorate the tree several times a day. As they got older, I would give them $5 and let them choose gifts for each other. I taught them how to wrap their presents, and they experienced the joy of watching someone’s pleasure at opening a gift from them. In their teens, the boys wound lights around the tree with me, climbed on the roof to hang lights with Dad; hauled boxes of ornaments upstairs to the living room; folded, stuffed, stamped, and sealed the Christmas letters; wrapped a few gifts; and even filled stockings on Christmas Eve (but only once – after that they decided it was more fun to be surprised). They played shepherds, wisemen, and Joseph in the church Christmas pageant, sang and played in school Christmas concerts, and spent their own money on gifts for family and friends. I invite my students to get involved, as well. 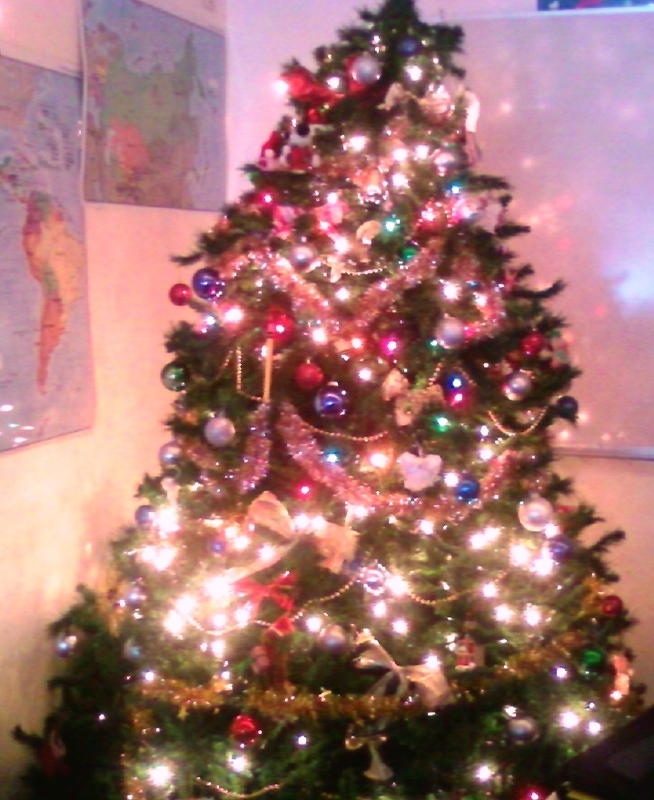 The tree pictured in this post was assembled and decorated by this year’s students; I never laid a finger on it. I also had strings of lights around my bulletin boards, and icicle lights hanging from my ceiling – all hung by students. Our class adopted a needy family for Christmas, and as gifts came in, students would wrap them. The 7th and 8th grade girls got a kick out of playing Secret Santas to all staff members who didn’t have classrooms of their own (a list of about 50 people), and they discovered how much fun it is to give anonymously. I took my choir caroling around the entire campus – a first for many of them (when’s the last time you went caroling?). Getting your teens involved not only benefits them, but it can also lessen some of your own stress. What’s on your list of last-minute, unfinished projects? Invite your teen to give you a hand, and then find a way to celebrate when the task is done, whether it’s with a run to Starbucks, or making popcorn and watching the Grinch together. Where’s the Dancing Penguin Ornament? I remember the year my mom tried to ruin my Christmas. I was still in high school, and she had the audacity to change the color of the felt tablecloths! For many years, two RED cloths, made by my mom and trimmed with white pompom fringe, draped both the coffee table and the fireplace mantle. A third fringed circle of red skirted the tree. But that fateful year, she made new ones – and they were GREEN. I couldn’t believe it; she had messed with my traditions, and I was not happy. We parents are often surprised by how adamant teens can be about sticking with tradition. Consider for a moment how many things in their lives are changing – often more quickly than they’d like – and you can see why they want their holiday traditions to remain the same. There’s comfort in familiarity, especially if there’s been upheaval in other areas of their lives. Kids who’ve had parents split up, or who’ve had a parent lose a job, are looking for reassurance that some things won’t change – and those things, even the small ones, can be important to them. But even if they haven’t experienced upheaval, teens are still experiencing change: they’re maturing physically and emotionally; their relationships with those around them (friends, family, love interests) are in constant flux; the expectations put upon them are intensifying. It’s no wonder they’re seeking consistency in what seems to us to be the little things: a special plate for Santa’s cookies, the placement of the tree, or even a perennial ornament. 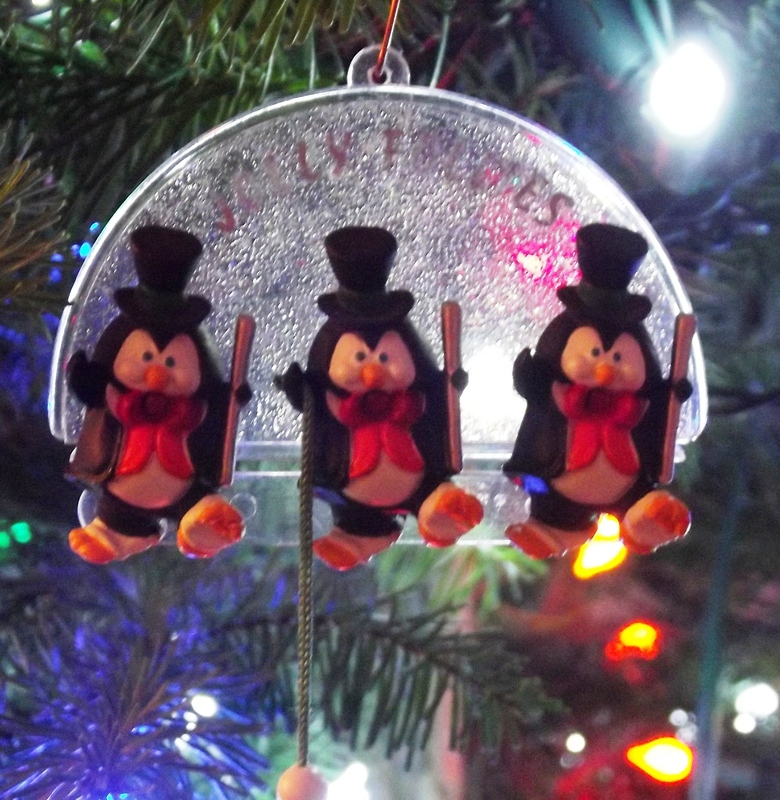 My boys hunted high and low one year for the “dancing penguin ornament,” and they were dismayed to learn it was broken. “You can fix it, right?” they asked – and were relieved when I did. Those penguins still dance on our tree. If your teens pester you about keeping their traditions, you can pat yourself on the back for providing them with an anchor in the storm of adolescence. Find the ornament, move the tree, play the music – and remind yourself that the day may come when they won’t be home to make sure you’re doing it right, because they’ll be off starting traditions of their own. Oh – and my mother still has that green felt drape for the mantle, even though she no longer has a fireplace. And I still whine because it isn’t red.